Incorporated in 1961, Ajinomoto (Malaysia) Bhd is (Ajinomoto) is amongst the earliest Japanese companies to set up its operations in Malaysia. It started off as a distributor of monosodium glutamate (MSG) under the Ajinomoto brand. 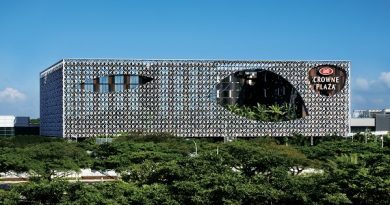 Subsequently, in 1965, Ajinomoto started to manufacture MSG and soon after, many related products such as flavour seasoning ‘Tumix’, menu seasoning ‘Seri Aji’, and industrial seasoning in its current facility at Jalan Kuchai Lama, in Kuala Lumpur. 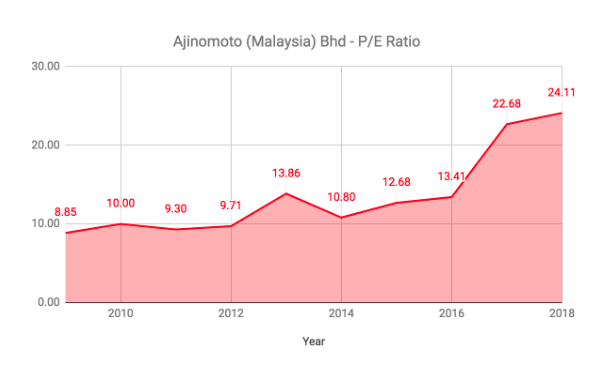 Presently, as at 4 January 2019, Ajinomoto is worth RM 1.13 billion in market capitalization, a multiple of 5 – 6 times from RM 170 million in 2009. So, what made shareholders of Ajinomoto rich? In this article, I’ll revisit its fundamentals and bring you an update on its recent financial results. It would answer why its shareholders have built wealth for the long-term and how we should approach stock investing in 2019 and beyond. 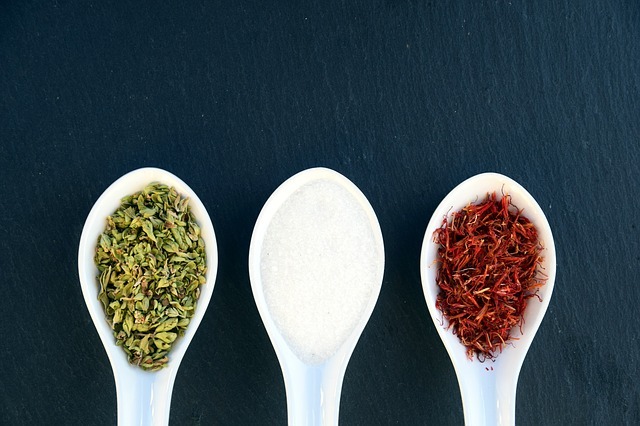 Therefore, here are 11 things to know about Ajinomoto before you invest. Ajinomoto has 10 sales branches in Malaysia and 1 sales office in Saudi Arabia to distribute its products to its customers. Ajinomoto has achieved CAGR of 5.19% in domestic sales over the past 10 years, increasing from RM 166.0 million in 2009 to RM 261.7 million in 2018. Concurrently, Ajinomoto has achieved 9.39% in export sales in the 10-year period, growing from RM 77.8 million in 2009 to RM 174.6 million in 2018. Hence, it is evident that export sales have grown faster than domestic sales. In 2018, 40.02% of Ajinomoto’s total revenues are made up of export sales, up from 31.92% in 2009. Ajinomoto has achieved consistent growth in both revenue and profits for the past 10 years. Sales increased at CAGR of 6.68% from RM 243.8 million in 2009 to RM 436.3 million in 2018. With improving margins, it increased its shareholders’ earnings by CAGR of 12.77% from RM 19.07 million in 2009 to RM 56.26 million in 2018. During the 10-year period, Ajinomoto has made 10-Year Return on Equity (ROE) of 10.88% a year. It means, it has a track record of generating RM 10.88 in earnings from every RM 100.00 in shareholders’ equity from 2009 to 2018. 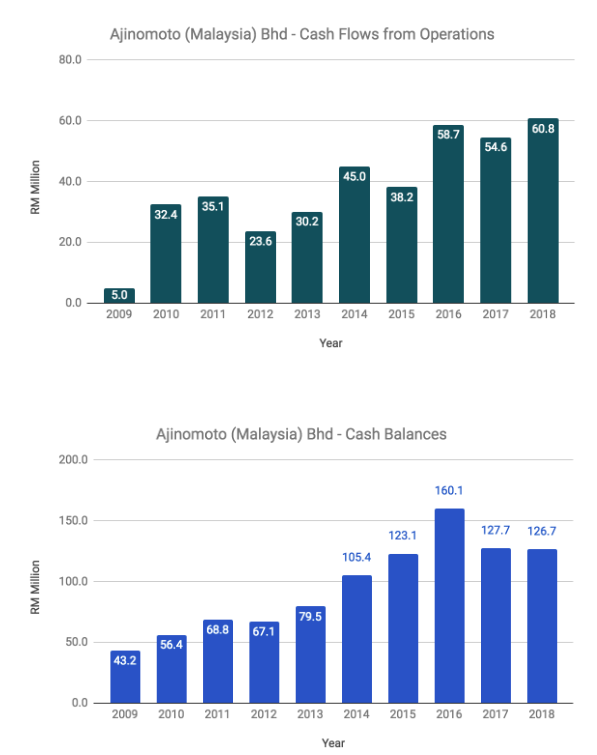 From 2009 to 2018, Ajinomoto has brought in RM 383.6 million in cash flows from operations and received RM 25.7 million in interest income. From which, it has paid out RM 196.2 million in dividends to its existing shareholders. It has increased its cash balances from RM 43.2 million in 2009 to RM 126.7 million in 2018. For the past 12 months, Ajinomoto has generated RM 437.5 million in revenues and RM 58.6 million in shareholders’ earnings or 96.3 sen in earnings per share (EPS). As at 30 September 2018, Ajinomoto has RM 435.6 million in equity and zero borrowings. It reduced its cash reserve to RM 96.8 million presently. Ajinomoto Co. Inc is the main shareholder of Ajinomoto (Malaysia) Bhd with 50.38% direct shareholdings as at 29 June 2018. Naoko Yamamoto who is an employee of Ajinomoto Co. Japan since 1991 had been made CEO of Ajinomoto (Malaysia) Bhd. As at 12 February 2018, Ajinomoto has announced that it had signed a Sales & Purchase Agreement (SPA) to acquire a piece of freehold land measuring 2.03 million sq. ft. at Techpark @ Enstek for a total price of RM 86.1 million. The land is intended for Ajinomoto to construct itself a new manufacturing facility to keep up with increasing demand for its products for the long-term. As at 4 January 2018, Ajinomoto is trading at RM 18.60 a share. Hence, its current P/E ratio is 19.31 based on its most recent 12-month EPS of 96.3 sen calculated in Point 5. It is above its 10-Year Average of 13.54. 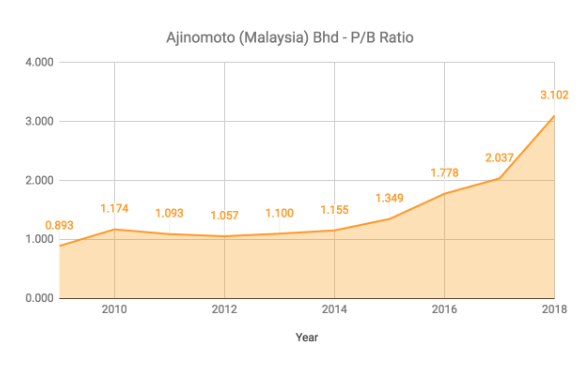 As at 30 September 2018, Ajinomoto has net assets of RM 7.16 a share and thus, having a current P/B Ratio of 2.60, above its 10-Year Average of 1.47. In Point 3, I have calculated that Ajinomoto has grown its earnings at a rate of 12.77% in CAGR. Hence, its PEG Ratio is 1.51, which is evidently above 1.0. It indicates that its stock price is now overvalued according to the PEG Ratio formula. 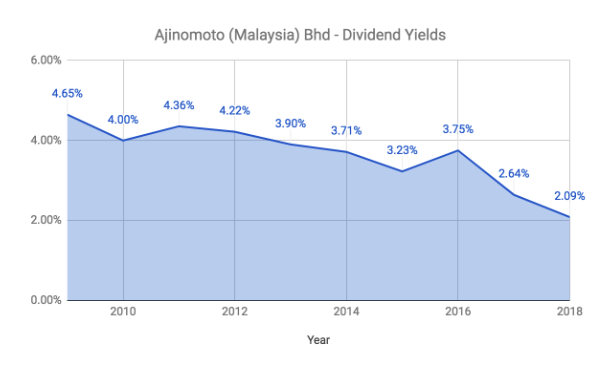 In 2018, Ajinomoto has paid out RM 0.465 in dividends per share (DPS). Thus, its dividend yield is 2.50%, below its 10-Year Average of 3.65%. Evidently, Ajinomoto’s stock price performance has mirrored its growth in all of its key aspects in its financial results: sales, profits, operating cash flows, and its cash reserves. It is another example of a stock where ‘Growth’ in profits has led to ‘Growth’ in stock prices. So, is this a good time to invest in Ajinomoto at RM 18.60 a share today? 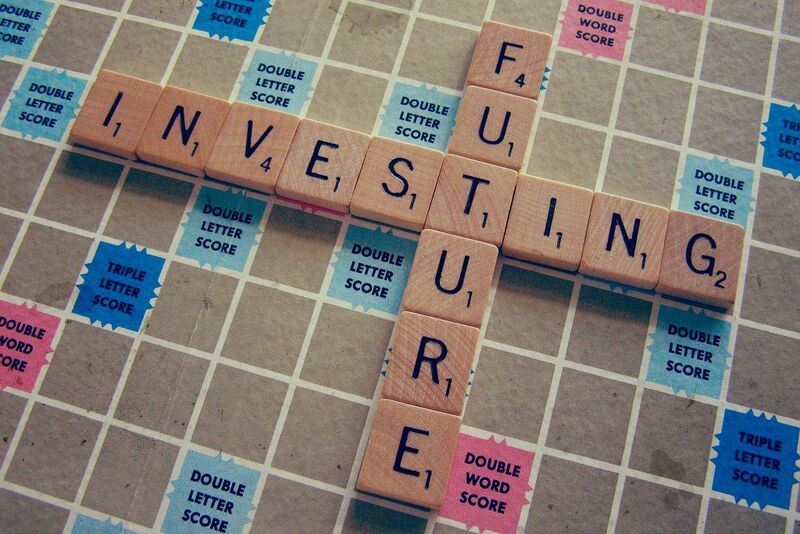 Firstly, its fundamentals are intact and hence, passed the very first criteria of a stock worthy for investment. Secondly, based on valuation figures above, I find that Ajinomoto is trading close to its highest P/E and P/B Ratio, above 1.0 in its PEG Ratio and close to below to lowest dividend yields. All of them indicate that Ajinomoto is priced less attractive than before at least from the viewpoint of a value investor. In this case, an investor would keep the stock in his watchlist and may consider investing its shares in the future if it has become cheaper. ← Should We Invest In IJM Plantations Bhd After A 55% Drop?